Successfully Added HK Warehouse Blackview BV9000 Pro Rugged Phone - Octa-Core CPU, 6GB RAM, Android 7.1, IP68, 4180mAh, 13MP Cam (Grey) to your Shopping Cart. If you’re looking for an Android phone that keeps you connected while enjoying the outdoors, the Blackview BV9000 Pro is perfect for you. With its IP68 rugged body, this rugged smartphone is fully water resistant. It furthermore is protected against drops and dust so you won’t have to worry about carrying it along into the wild. With its Dual-IMEI numbers and 4G support, it treats you to great connectivity. The phone furthermore comes with a professional-grade 13MP Dual-Rear camera. This snapper lets you shoot breathtaking pictures and FHD video of all your upcoming trips and outdoor adventures. With its whopping 4180mAh battery, it treats you to an unbelievable 27 hours continuous talk time and up to a month worth of standby time. On its 5.7-Inch display, this rugged Android phone treats you to stunning HD visuals. The screen has been equipped with Corning Gorilla Glass 5 for extra durability. Therefore, you won’t have to worry about it scratching or breaking while using it outdoors. The cell phone runs on the latest Android 7.1 operating system for a smooth user experience. It furthermore comes with 128GB internal storage for you to safely store all your files and media. With its fingerprint scanner, this phone brings along great security. It additionally lets you access all your files in the blink of an eye by the simple touch of a finger. The Blackview BV9000 Pro Android phone holds a stunning Octa-Core processor. This CPU has been clocked at 2.6GHz and brings along a powerful yet energy-efficient performance. Along with the phone’s 6GB RAM, you’ll be able to enjoy the latest and most demanding software features without dropping a frame. Whether you’re into games, movies, or Apps – there is nothing this Android phone does not handle. 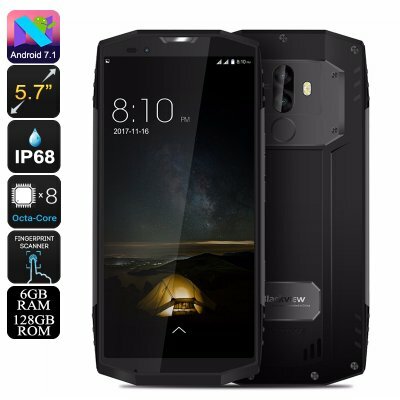 The Blackview BV9000 Pro comes with a 12 months warranty, brought to you by the leader in electronic devices as well as wholesale Android phones..